Loose ends to tie up! Since I was not able to get a replacement scanner yet, today's post will consist of a little desk cleaning. 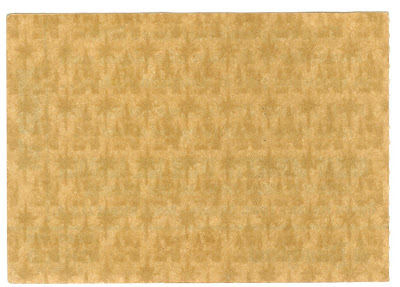 First up, This poor torn ticket has been begging me to post it, it just keeps looking at me and wont let me file it away. 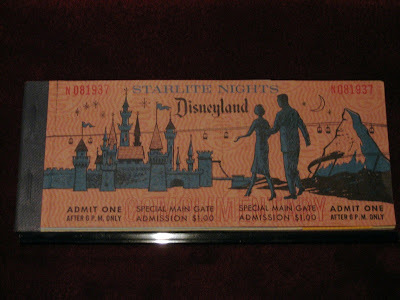 So, from 1965 (most likely May) this "E" Ticket is I believe from part of the Starlite Nights series. The ticket book included two admission tickets and I think 10 tickets (2 each, A thru E). These use the same blue ink as the Date Nite Series (link). Mr. Lincoln opens July 1965! How about a ride on the Flying Saucers? You better, they wont be there much longer. 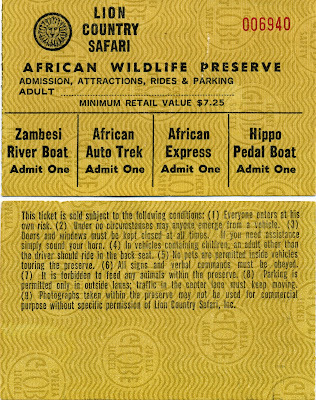 The back is not the same as the generic "E" ticket. This ticket is not good during all regular hours. In fact, it's only good after 5:00pm and it self destructs after the summer season. I have no idea where on the net I got this picture, but I think this is the type of booklet the "E" Ticket above came from. This book is a 6:00pm book however! Last up today, this little item keeps asking for post time too. It's a decal from the late 60's / early 70's? 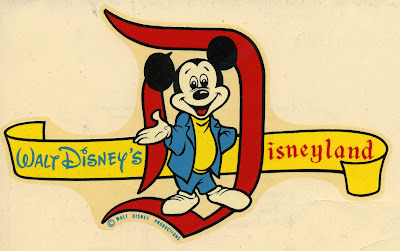 To me, Mickey looks cool here and you gotta love the stylized "D". 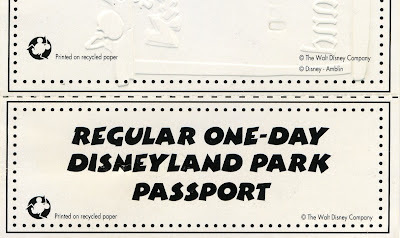 Today lets take another look at the "stub" style of Vintage Disneyland Tickets. My first post regarding these tickets took a close look at how these were used and a close up of my Skyway to Fantastyland Ticket. Since my collection is lacking with these type of tickets Major Pepperidge over to http://gorillasdontblog.blogspot.com/ was kind enough to scan and share these from his personal collection, Thank You Major! Check these out, Major has some NICE samples here. All are extremely rare. Any of these tickets that are not "torn in half" are valuable just because they were never used. Think about it, these were only purchased inside the park and with the express intent to use them right away. Unlike leftover "A" tickets in a used ticket book, it would be rare to bring these home, most I have seen are just the 1/2 you get to keep after you use it. 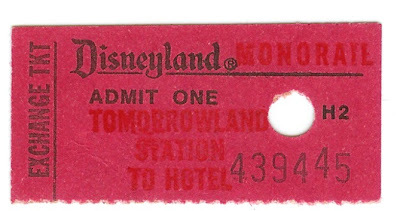 Here is a close up of Major's Monorail stub ticket. 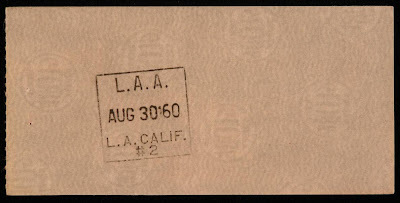 Interestingly, the "260" on the bottom back of the ticket does not mean February 1960. I have seen the "260" on lots of these tickets and Disneyland Parking tickets, not sure what it means, but it's not a date code. What do you think the "H1" was for? 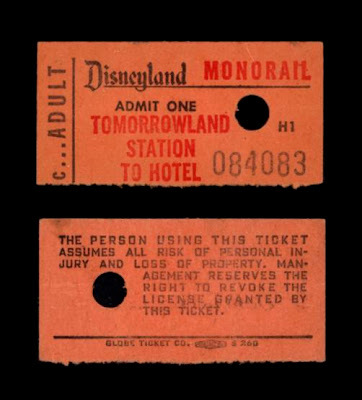 Here is a scan of one of my little stub tickets, this one is similar to Major's Monorail ticket above with the exception of the left side, it's an "Exchange Ticket". What does that mean? Exchange for what? And who's idea was it to use red ink on red paper!!!!! Oh and what does "H2" mean? My new scanner is still DOA, it just blinks and clicks, I have to return it to Fry's today, wish me luck! See you on tomorrows post! 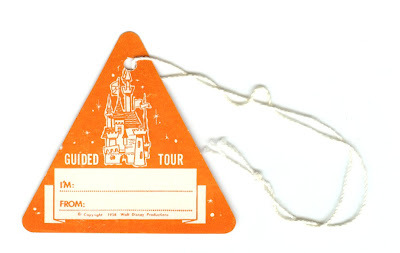 From 1958 we have a portion of the ticket that was used for the Disneyland Guided Tour. These tickets were long and had many sections; Main Gate, Guided Tour, and 1 or 2 of these tickets so you could have some fun after the tour. (I have a full one of these from the 1970's - I'll post it when the scanner gets fixed/replaced). These little tags are fun! You tie this to one of the buttons on your shirt to identify yourself and where you are from. Do they still do this? That's kind of fun to see where everyone else on the tour is from. I have a few more of these little tags, they are different colors and have names and towns on them, but this one came with the ticket above. 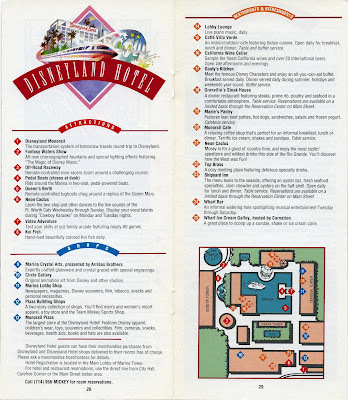 I have never taken the Guided Tour at Disneyland, some Disneyland fan I am huh? I always figured I could manage those 3 or 4 hours better myself. Now they have 23 different Guided tours so I couldn't even decide which one to take! Have you heard about the new "ultimate" tour where you go INTO Walt's apartment? I am not even sure what to make of that, you? It seems altogether wrong, but intriguing at the same time. Well, well, well.... If you've been following my posts regarding the sale of these "first style" of tickets books sold at Disneyland, you might find this fascinating. I predicted these late 1955 ticket books would sell for over $250. I predicted this price based on the fact that the seller just bought them on eBay a few months back for around $350 (actually that auction came with a couple other early 1956 tickets too). 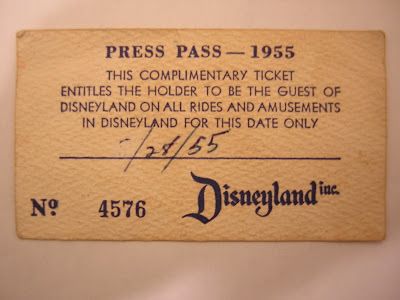 I've seen some high prices for Vintage Disneyland Tickets before, $300+ for super rare. But this seems way out of line. Eight bidders placed 26 bids to bring this auction to stratospheric levels. I know you slide collectors have paid well over $200 for some classic sets (Hey, I watch that stuff on EBay too!) But this has to "take the cake" for Disneyland stuff that Walt didn't actually sign himself! A good blogger buddy of mine sent me a scan of a Complete 1955 Ticket Book that his has (I will post it if he says its OK or maybe he will post it on his blog). A suggestion for my buddy; put that ticket book in a safe deposit box and insure it! 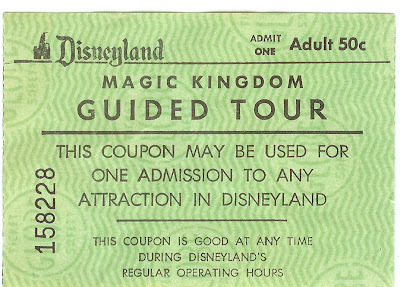 While we are on the subject of EBay, does anyone know if this is a legitimate Disneyland Press ticket? This is currently listed on EBay (180210599334) and is at $20.00. This ticket looks pretty simple and easy to duplicate. Has anyone every seen these before? Thanks for indulging my EBay hobby (lets not call it an "obsession" even though it is!). If this EBay stuff bores you, just remember, that's where 90% of my collection came from. Tomorrow we'll get back to some stuff that is actually IN my collection. 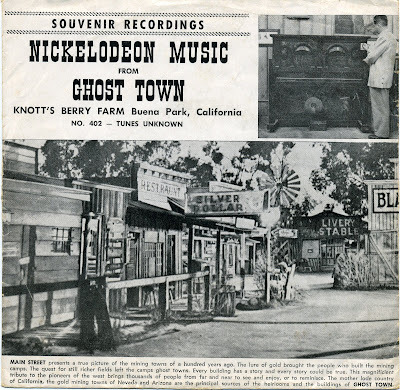 Here's an odd little Knott's Berry Farm Souvenir Record. I can assume there was a series of these as this one is "No. 402 - Tunes Unknown" Maybe the other tunes in the series were known! This item is not dated, if I had to guess I would say late 50's/early 60's, does anyone know when these where sold? 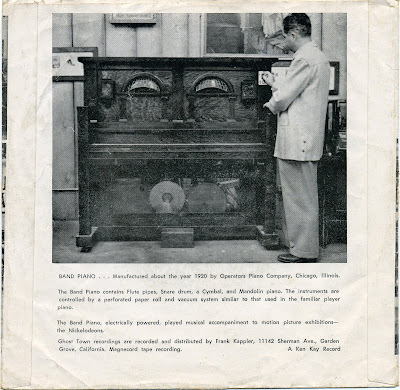 The back of the record sleeve has a picture of the "Band Piano". I seem to have a vague memory of there being a player piano at Knotts' around 1969 or 1970 (it's about as vague of a memory as the Chicken that played a song on a tiny piano for 25 cents!) Does anyone know where at Knott's this machine was located (the music hall?) and when was it there or was it even there at all? 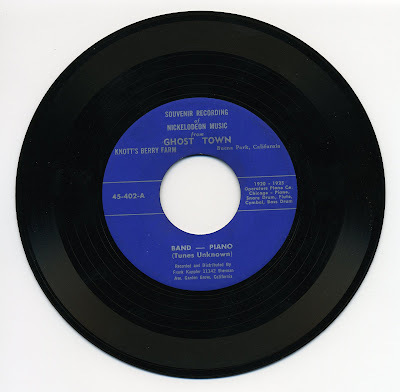 Here is the record itself. Yes it's on that famous label "Frank Kappler". I love 45's, I have about 600 of them!!! I know you are just dying to hear what this gem sounds like, so here is the first half of the record. Fortunately I have an old needle for just such occasions. I couldn't figure out how to post "sound"only so you can amuse yourself and watch the record spin around as you listen. That was funky indeed. I like little odd collectibles like this, I hope you enjoyed it as well. 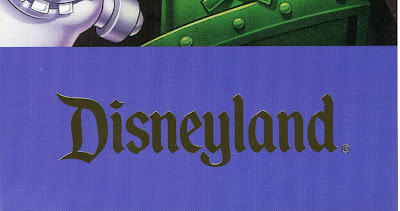 Fourteen years ago today - January 26th, 1994 - One year (and 2 days) after Mickey's Toontown opened, the new Land finally got an "E" Ticket attraction. OK, a "D" Ticket, maybe a "C". But at least it was an attraction! 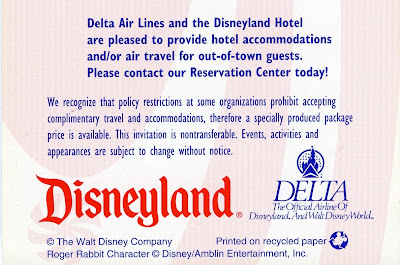 This Invitation is HUGE, just like Toontown's opening ticket, only one inch shorter. 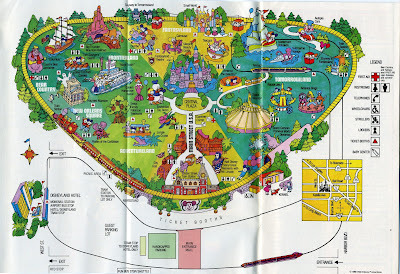 The one time I rode this attraction I thought it was fun, it seemed like a mix between Mr. Toads Wild Ride and the Tea Cups! This is the part the didn't fit in my scanner. It not a tear-off, it's just kinda there. The back is interesting. Apparently you had to RSVP for this grand event. Your special visit included; "A whirlwind celebration that gets hopping in the morning" I wonder what that consisted of? AND "A Sneak peak at What's Upcoming at Disneyland Park" Hmmmm, what did people get to see there? "You wont believe what our Imagineers are creating" Anyone know what was on display in this "private preview"? Looking at the fine print it appears that if you lived out-of-town you got complimentary air fare and hotel accommodations! I wonder exactly how you got invited to this thing anyway? Did Disney really think Roger Rabbit was going to be the next Mickey Mouse? The movie was good, but, something about it seemed uninspired to me. I think that uninspired feeling translated right into Toontown and Roger Rabbit's Car Toon Spin. Alright, I'll take my amature movie critic hat off now. 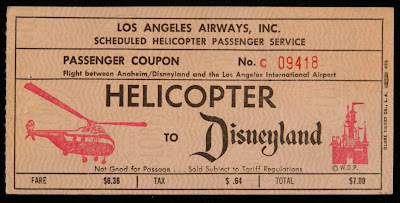 Today's little post is a Helicopter to Disneyland Ticket. 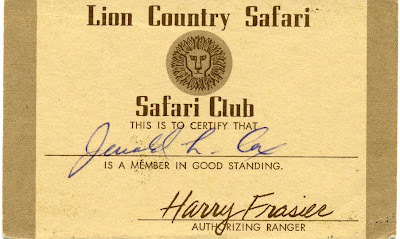 Many of you know the history of this service, if you don't, well, I like to stay in the "Happy" side of blogging so we'll stick to the ticket itself today. 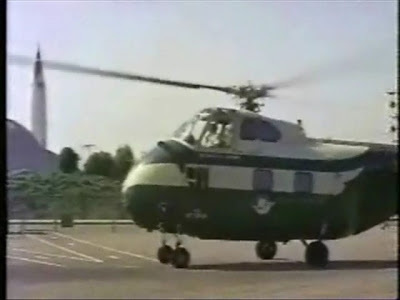 Here's a pic of the copter landing behind Tomorrowland in 1956. I bet you can hear THAT inside the berm! Tomorrow come back and join us for the Grand Opening of Roger Rabbit's Car Toon Spin! It was 15 years ago today that our beloved Mickey's Toontown opened it's technicolor gates. 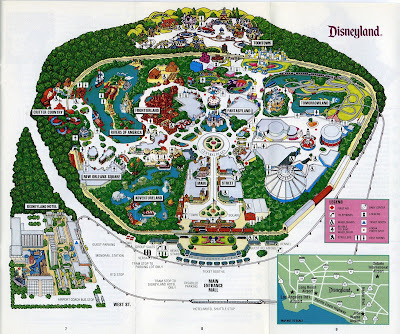 According to Wikipedia, Mickey's Toontown was actually two previous projects merged together; Hollywoodland (to be located behind Main Street) and Mickey's Birthdayland (to be located at present day Toontown). Interestingly, this Special Edition Commemoritve Passport was not valid until two days after Toontoon opened on January 24th, 1993. 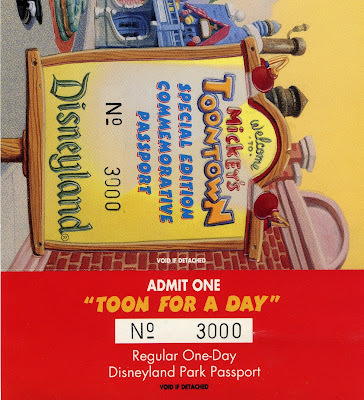 Did Toontown open two days early or did they just make people wait two days to used these special tickets? As you will see on my post in 2 days, January 26th 1994 was chosen as the day to open Roger Rabbit's Cartoon Spin. This ticket is so huge, dare I say it's "cartoonish"! Measuring a ludicrous 14 inches by 4 inches, there is no way to scan the whole thing. Here is the main part, this is the part you get to keep after you use it. Here is the admission stub section. 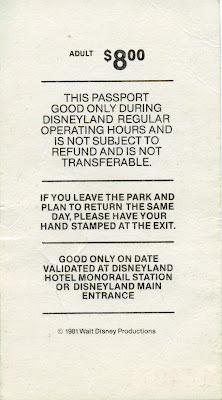 Yes, this ticket was never used and it's still valid today. I like that even numbered serial number, I have no idea why. The back is pretty simple, but I think the front makes up for it! These tickets came in this HUGE envelope, again it won't fit in my scanner, but you get the idea. 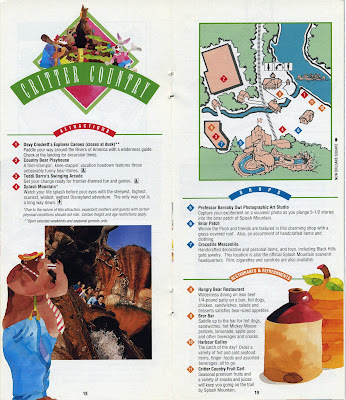 Here is the Souvenir Guidebook Cover from January 1993. The inside of the front Cover. Nice Trifold map showing the latest "Land". 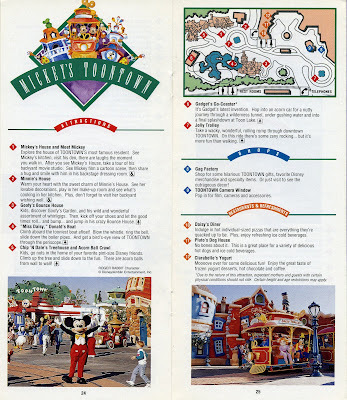 Mickey's Toontown gets it own section, just like a real "Realm". 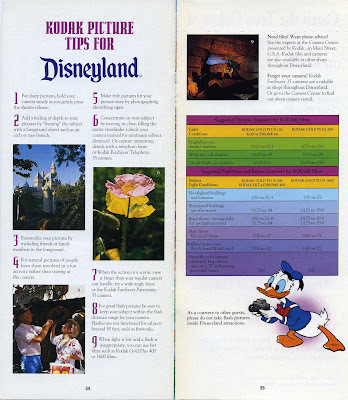 To help celebrate Toontown's Anniversary I'm going to post the rest of the Guide Book. I'll use just about any excuse to post these guide books, I love them! 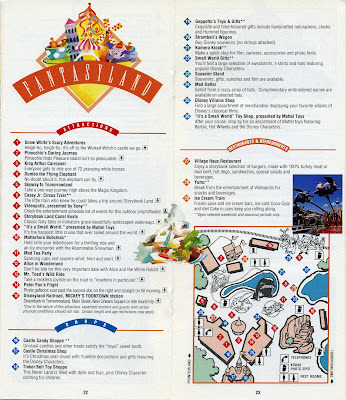 If you read thru these pages (like I did) you will notice the park changed a lot in the last 15 years. For the better or for the worse? I'm thinking Toontown was the begining of some "dark clouds" that were starting to form over Anaheim in the early to mid 1990's... That's probably why it's my least favorite Land. 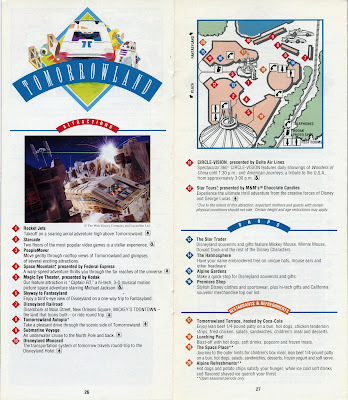 However, after this post I feel guilty for only have been to Toontown twice. I will stop in next time to ride my favorite attraction there, the wacky Jolly Trolley, what, it's closed, that figures! 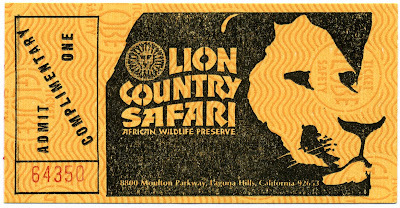 Today lets take a look at a few Tickets from "Lion Country Safari" Irvine, California. I only went there once and that was in 1972! 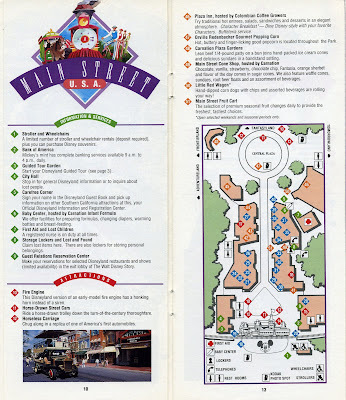 As a kid I remember the car drive thru part was scary and the "theme" park seemed the same as Busch Gardens in Van Nuys. I was 7 so what the heck did I know! There are some great construction photos here: theimaginaryworld.com, also be sure to scroll all the way down to the link for the "now" photo's, sad. This first ticket would be the oldest of the three we will look at today. It's on thick globe paper, more like card stock. 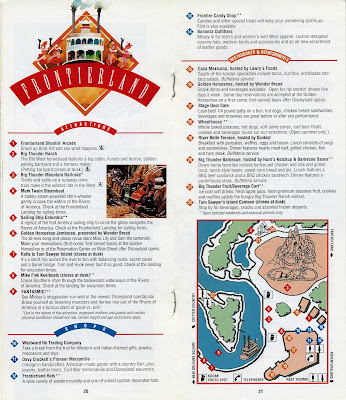 I am guessing they would punch out each of the four "attractions" once you rode them. Minimum retail Value $7.25, What was the maximum Value? Check out the rules on the back! 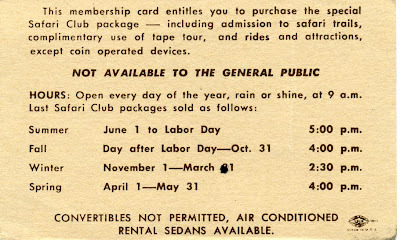 Here's a neat little membership card. "Not available to the general public" so who was it available to, the non-general public? I'm guessing this to be towards then end of the run for the Safari. While these are still on globe paper, they are not nearly as nice, the print is pretty cheap and the back is blank. I have a big stack of these in a tablet format, I suppose lots of people never got (or wanted) their Complimentary Tickets! What I remember most about Lion Country Safari the 1981 addition of the "Irvine Meadows Amphitheater". I have been there many times. To name a few; Jefferson Starship (when animals could still be seen behind the stage area! ), The Eagles and my favorite band RUSH! 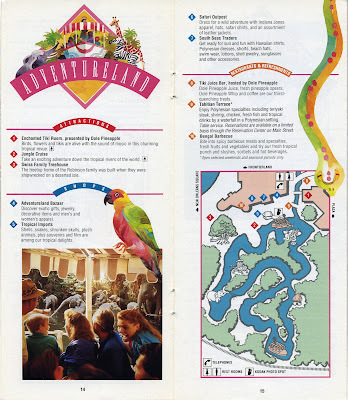 Yesterland.com has a nice write-up on Lion Country Safari, did you know the Original Lion Country Safari in Florida is still open? I didn't. Tomorrow; come join the Grand Celebration for ToonTown's 15 Anniversary Special Post! 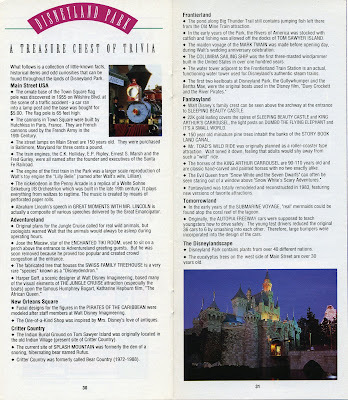 Back in 2000 I was collecting Disneyland Guide books at a steady pace and I guess I never looked inside some of them. As I have been making a list of my Guide Books recently (I'm almost there Jason!) I have found several that have tickets in them!!! 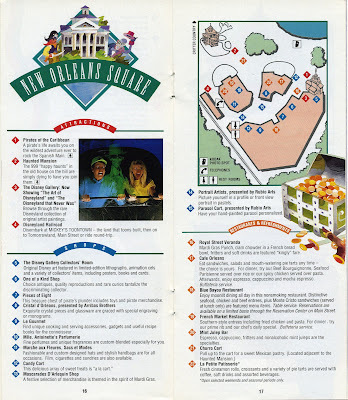 And most of the 1980's books also have the dated gate handout inside, oh boy, lots to post!!!! I found this little mint gem last night in a 1981 Guide Book. 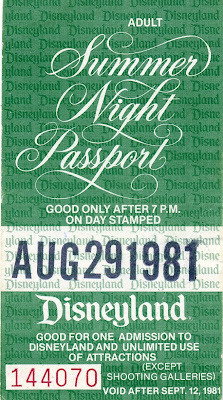 "Summer Night Passport" this was getting near the time when the A thru E ticket books were going to be phased out. (MUCH more on that in a near future post as I have found more on when and how in 1982 the transition occurred.) $8.00 for 7 P.M. to closing, August 29th, 1981 was a Saturday, I would guess they were open till 1 A.m. of maybe even 2.am. Not a bad deal for eight bucks! Hey the photo on the front of this 1981 Guide book looks a lot like the post card set I have been adding to the end of some of my posts (link). I guess they are from 1981! 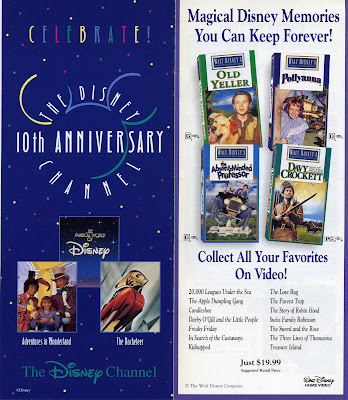 Wow, Disneyland of my teenage years! I swear it actually felt like the colors in this map! 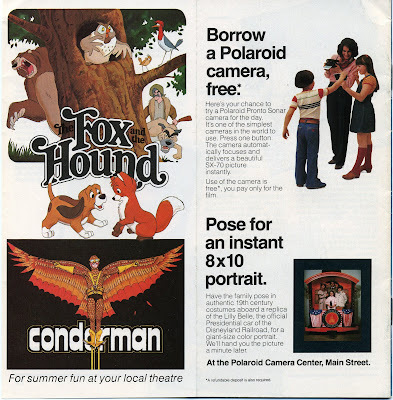 Back of the book has a neat promo for "Fox and the Hound" and "Condorman" I must have missed both of those. "Borrow a Polaroid for free"! Just buy the film, $15 for 8 so-so prints that probably wont last a lifetime! How about an 8 x 10 Polaroid taken on the back of the Lilly Belle (well, it looks like the Lilly Bell). I have never seen one of those, I wonder how well the 8 x 10 Polaroid format looked and has held up? Tomorrow, well, tomorrow is up in the air, tune in and see. Hall of Chemistry - 1956? 50th Post!!! & What Constitutes "Vintage"
Knott's Tickets From Disneyland Via the Fun Bus?